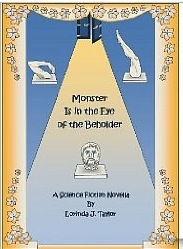 Lorinda J. Taylor’s imaginative and entertaining science-fiction novella, Monster Is in the Eye of the Beholder, reminded this reader of Mary Doria Russell’s The Sparrow (1996). Both works are first-contact stories that turn on what happens when human beings, acting with best intentions, behave in ways that cause catastrophic damage. Doria Russell and Taylor both explore the nature of good and evil, cultural difference, and prejudice, and both choose to tell their stories, for the most part, in framed flashbacks. Taylor’s epistolary Monster…, set in the year 3001, relies on official reports and journals/recordings kept by the major characters to tell the story of a first scientific expedition to the Planet Kal-fa. The story gets off to a quick start when a group of human xenoanthropologists encounters the Kal, a peaceful, telepathic, and spiritually evolved civilization of ‘teratoids’. The expedition leader is Professor Kaitrin Oliva, a scientist so enamored of life’s infinite variety that she fails to heed early signs that her expedition is heading toward disaster. The mission seems to be proceeding splendidly; however, two of the human scientists are gradually running amok, one of them via an egregious ethical lapse that, in turn, triggers long-repressed psychological and moral defects in the other—defects exacerbated by exposure to the teratoidal Kal. Speaking of the Kal, to reveal more here of their physical appearance and characteristics would be to ruin the credulity-straining surprise of why Taylor has used the term ‘teratoid’—i.e., monster-like—to describe them; suffice to say, no scientific expedition is likely to encounter a more ‘detached’ group of beings. Taylor does a fine job building to the violence that ends the expedition. Likewise, she deftly handles the official ‘inquisition’ in the wake of the mission’s failure, as well as the novella’s surprising, if somewhat unsettling parting shot (apparently humans aren’t the only species to suffer from cultural myopia). It is also commendable that, like Doria Russell, Taylor pays attention to anthropology, sociology, linguistics, and religion in her novella—a welcome change from the traditional hard-science emphasis that pervades so much science fiction. It seems appropriate to offer a few words about Taylor’s narrative stance. The epistolary form has its pros and cons. It can be employed to reveal a character’s most private, intimate thoughts, and is especially powerful when used to reveal the innermost longings and conflicts of characters operating in actual and/or emotional isolation (think Mary Shelley’s Frankenstein). Conversely, the epistolary stance can distance the reader—and not always in good ways—from the action of the story. That is to say, if the reader is too often reminded that what she is reading has already happened, then any more visceral, immediate connection to the characters and their various dilemmas is likely to be reduced. In such cases, it is almost as if the epistolary character/narrator is telegraphing the reader: “Don’t worry! Obviously, I’ve survived this episode–otherwise, how could I be recounting it?” Perhaps that is why this reader found the longest journal and report entries in Taylor’s Monster to be the most engaging; when the story was allowed to run on to six or eight pages, it was easier to forget that the action wasn’t taking place now (suspension of disbelief). On the other hand, the shorter journal/report entries featured in Taylor’s work tended to interrupt and flatten the story. But that is perhaps a purely subjective reaction, and, in any case, a minor flaw in an often engaging and thought-provoking story. Thank you so much, Jack, for the great review! I have no quarrel with anything you say about the actual story. Perhaps I would characterize (as I did on the back of the cover) the twist of perspective in the final sentence as “unsettling” rather than “depressing”; it perfectly reinforces the reason for the book’s title. I’m also pleased that you recognize the value of using anthropology, sociology, and linguistics – soft or peripheral sciences – as a foundation for SF. What I would quibble about is characterizing the book as written in framed “flashbacks” and as “epistolary.” Flashbacks indicate that the story starts in one time period and then cuts back to something that happened earlier. This can happen more than once in the course of a novel. An epistolary novel is written in the form of personal letters, although I checked the Wikipedia article and it indicates that one can include diary entries, newspaper clippings, recordings, etc. But when I think of an epistolary novel, I think of Samual Richardson’s “Pamela” and other 18th century forays into the nascent field of novel writing. My book is written in the form of the report of a government commission investigating the incident on the alien planet called Kal-fa.. That means it incorporates evidentiary material of various sorts. It includes Prf. Oliva’s introduction to the expedition, which she wrote before the expedition got underway; extracts from the thought recorders of the participants (a futuristic device that captures language-oriented brainwaves and allows users to record their thoughts directly without talking out loud); testimony from the hearings (think McCarthy or Watergate); and finally a concluding communication from one of the alien planets. The only actual letter in the book is the missive that went astray and was leaked to all the galaxy. And I would see no reason why this would make one think that all the characters survived. Certainly, recordings of any kind – oral, thought, or written – can outlive their producers; even if none of these characters had survived, the contents of their thought recorders would still have been in existence. I think maybe the physical format of the book is its own worst enemy. It might be easy to overlook the first page, where I state with proper governmental pomposity that this is “Proceedings of the Hearings, etc.” If you skimmed over that or missed it entirely, it might be easy to get confused about what one is reading. If so, I make my apologies. It would be easier to recognize the true situation if the book were printed in an 8.5″ by 11″ format, where some text could be included on the first page. All that being said, I’m certainly pleased with this review and again I thank you so much for writing it. 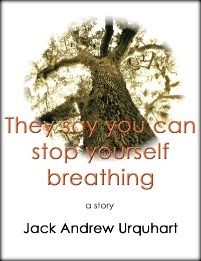 A very complete and honest review Jack, I really like your style in parsing out the work. I will have to check this one out. Thanks, Peter. I hope you’ll enjoy Lorinda’s story. If you like Sci-Fi, you might also check out Mary Doria Russell’s *The Sparrow. * I don’t read sci-fi that often, but I loved Russell’s 2-book set, which as I indicated above, was one of the reason’s I enjoyed Lorinda’s “Monster…”. Anyway … thanks so much for stopping by again.